...but you have to help yourself a little as well. Your ears, your tolerance of noise, your experience of noise and all sorts of other stuff are unique to you. We can't emphasise enough how it's not possible for us to tell you exactly which earplugs will work for you. We can make suggestions, but ultimately it is down to how you get on with the earplugs. Recommendations from friends are great, but their ears won't be the same as yours. What we can do: suggest earplugs for specific needs e.g. music, swimming. We can point you to our Earplugs User Guides so you can find out how to get the best out of your earplugs. What we can't do: mend broken relationships, guarantee to block out all noise, stop your neighbours making your life a misery, solve your medical issues, bring about world peace. So PLEASE READ the FAQs below before deciding on which earplugs to buy. We ALWAYS recommend an Earplugs Sample Pack as your first purchase, particularly if you need earplugs to help you sleep. By the way, we don't insist like some websites that you have to have an account with us. We make it easy for you to place an order without one. If you want to create an account, that's fine too. * Always read the instructions. Don't gamble on knowing how to apply your earplugs..
* If the earplugs make your ears sore, choose a different type or don't wear any. * If you're allergic to any of the ingredients, don't use those earplugs. * If you need to hear certain sounds e.g. alarms, then should you be wearing earplugs at all? * If you get silicone or wax stuck in your hair, remove it yourself. * If you keep getting silicone or wax in your hair, use a different type of earplug. We absolutely can't tell you how to run your life or be responsible for your every move. Everything involves risk. Staying alive is usually down to the successful avoidance of risk. We often receive calls from people (mostly women) who are in despair at their partner's inability to recognise that their snoring is having a major detrimental impact on their lives. It's very sad. We know that relationships can be wrecked as a result. So please, if you're a snorer, don't blame your partner for being a light sleeper. You're the one making the noise. Perhaps it's time you did something about your own lifestyle which might, just might, help? 1. Overweight? Losing weight can help reduce how loudly you snore. 2. Smoke? Congested nasal passages and a rattly chest caused by smoking is not going to help your sleep partner. 3. Drink? Deeper sleep induced by too much alcohol can make you snore more often and more loudly. Most people tolerate earplugs extremely well - provided they use them correctly and have no known allergies to the ingredients. However, you should be aware that an earplug is effectively a foreign body in (or applied to, in the case of silicone and wax earplugs) your ear. We recommend gradually increasing the amount of time you wear your earplugs if you are using Snorestore's products for the first time. In rare cases, initially you might be hyper aware of your own pulse. This effect usually disappears after a short time. 1. A high decibel rating on a set of earplugs does not mean you will be able to block out all sound. 2. Not all earplugs fit all ears. Your ear size and shape is unique to you. You may need to try several before finding one which works. That's why we recommend an earplugs sample pack to start with. 3. Sometimes a lower rated earplug will produce a better result. 5. Silicone earplugs on the whole are more comfortable. Do any earplugs block out 100% of the noise? The highest Noise Reduction Rating currently offered by an earplug is around 39dB. If you refer to the chart at the end of this page, you will find that decibel levels up to the earplug's NRR will be blocked out entirely. Any noise over the earplug's NRR will be heard. Another important factor to note is that the body absorbs sound; so short of living in a sound proof chamber, it is almost impossible to block out all noise. 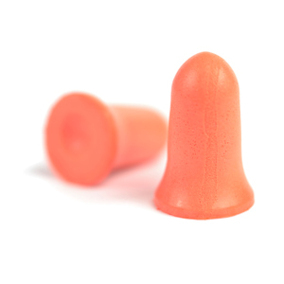 Earplugs are designed to take off the harshness of the noise and bring it down to a safer, more tolerable level. Can I carry on a conversation wearing earplugs? Yes, usually. Most people without damaged hearing have no problem carrying on a conversation while wearing earplugs. Often, in noisy or loud environments, earplug wearers discover that the earplugs seem to "filter" out the background noise, actually making conversation and music clearer and easier to understand. How long does a pair of earplugs last? For foam earplugs which require rolling before insertion, e.g. Spark Plugs Soft, Mack's Ultra etc., we recommend you change your earplugs as soon as they become dirty, or when they stop returning to their normal shape when you remove them from your ear canal, whichever comes first. 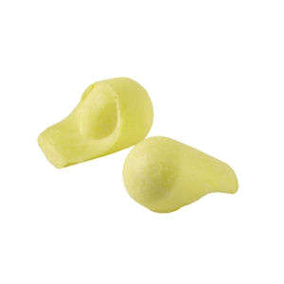 For non-roll earplugs such as EAR Soft 21, then start a new pair as soon as they become dirty. 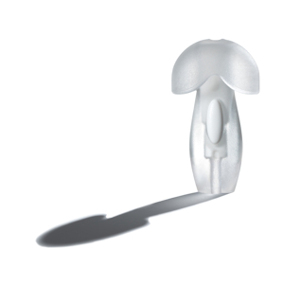 Silicone earplugs can be used until they lose their stickiness and thus stop sticking to the ear, or until they become dirty, whichever comes first. Wax earplugs can be used until they become dirty, or until their effectiveness is reduced. If they start to break apart, cease using that pair immediately and start on a new pair. The responsibility for the use of ear plugs sold on this website is solely that of the user. Snorestore disclaims any and all liability, loss or otherwise, which may occur through negligence in the use of these products; to include insertion, application, wearing and the removal of these products. Customers are reminded to use discretion when wearing ear plugs, as the ear plugs will reduce outside sound significantly, especially in the case of important sirens, alarms or warnings. 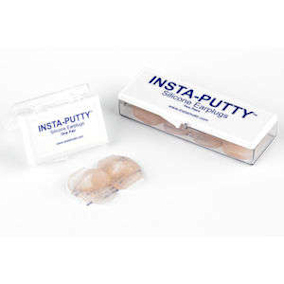 Customers must exercise care and proceed cautiously when inserting, applying (silicone and wax products) and removing ear plugs, to prevent potential damage to the ear. Customers must read the instructions provided with their earplugs carefully. Damage to the ear can result if you do not do this. Additionally, your earplugs will not work if they are not worn correctly. Used correctly, earplugs are safe. Put them in places where they're not supposed to go, and you could hurt yourself. They can't get into these places without your (or someone else's) intervention. What do the terms SNR and NRR mean? SNR is the noise reduction rating standard in Europe. NRR is the rating system used in North America. Usually the NRR figure is slightly lower than SNR and is to do with different measuring methods and standard deviation. In pratice, there is not a massive amount of difference between the two. If you were to measure two sounds, the first coming in at 60dB and the second at 80dB, the difference of 20dB would actually mean that the second sound is a HUNDRED TIMES LOUDER than the first. Put more simply still, an increase or decrease of three dB represents a doubling or halving of intensity - the energy it contains. So, for example, 73 dB is twice as intense as 70 dBA. To read more, please go Google here. Are earmuffs better than earplugs? Can my ears get used to the noise that causes hearing loss? No. If your ears seem to get used to the noise, it is only an effect caused by the deafening of your ears. Ears do not "toughen up" with repeated exposure to noise. Will the same earplugs always fit me? No. Yours ears change shape over time. What fits you one year might not fit you the next. Don't believe us? Read this! Big ears: they really do grow as we age. I've already lost some hearing; why do I still need earplugs? Any degree of hearing loss is permanent and while earplugs can't roll back the damage, they can help prevent it getting even worse. The proper use of earplugs can also help prevent temporary hearing loss, and allow existing temporary loss to recover before it becomes permanent. How can I tell if a noise could damage my hearing? People differ in their sensitivity to noise. As a general rule, if you have to shout to communicate with a normally hearing person at a distance of about three feet, the noise is potentially harmful. Other signs to watch for are if the noise hurts your ears, causes your ears to ring, or causes temporary hearing loss for up to several hours after exposure. As the chart below illustrates, the start of unsafe levels begins at approximately 85 decibels. It is not only the level of noise, but also the duration of exposure that determines whether it is a minor irritant, a definite disturbance, or a threat to your hearing. What laws protect me if I work in a noisy environment? Since 1989, UK noise regulation has been based on European standards. Under a 2003 European Union directive, these laws were replaced in 2006 with upgraded regulations. The leisure industry, which tried for exemption from the improved standards, has had to comply since April 2008. In the UK, the Noise at Work Regulations 1989 say employers must reduce the risk of hearing damage to the lowest level reasonably practicable and maintain all equipment. Of course, these regulations and laws only apply to employees. If you're a musician, rock chick or biker, it's entirely up to you if you want to protect your hearing. Prolonged exposure to any noise above 85 dB can cause gradual hearing loss. These questions and answers are drawn from various parts of the web, in particular McKeon's Inc, supplier of our best-selling Mack's earplugs.